Low cost burner control for new installations and Siemens LFL / LGK replacement. 62 different lockout codes using the LED's to tell you exactly what the problem is so you can fix it quicker. Built in self checking circuit for ionisation rod, this upgrades your burner to >24hr continuous use. 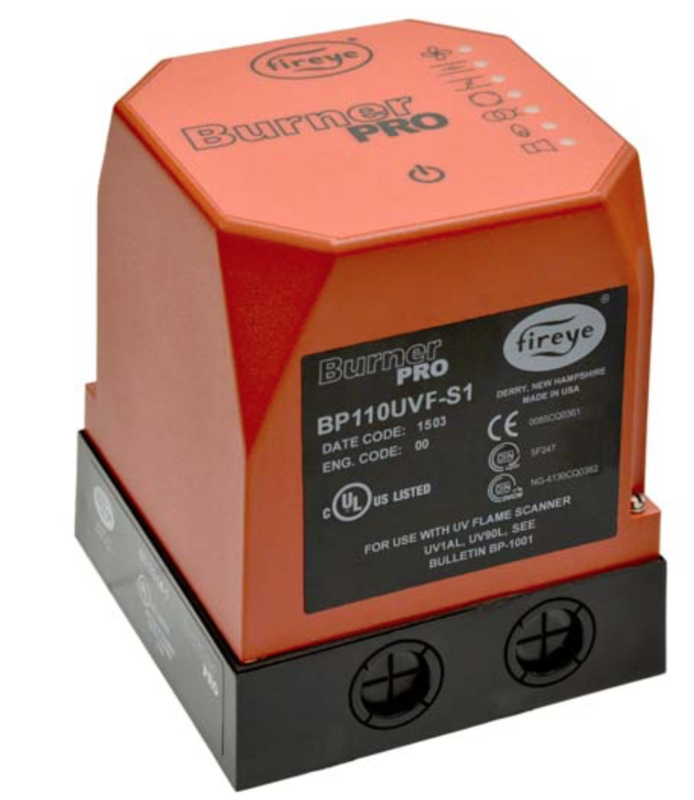 The Fireye BurnerPRO is a compact, microprocessor based, primary flame safeguard control system designed to provide the proper burner sequencing, ignition and flame monitoring for on-off, multi-stage, or modulating burners used in commercial heating and process equipment firing oil and gas fuels. The BurnerPRO flame safeguard offers two built-in amplifiers, which allows for use in UV only, FR only, and UV+FR applications. Flame monitoring for UV is accomplished by using available UV scanners: UV90L & UV1AL. Flame monitoring for FR version is accomplished by using available ionisation rod: 69ND1. The FR amplifier circuitry is subjected to permanent self-checking, which allows it for use in applications that require burner cycle that runs for more than 24 hours. When operated as a UV control, the system is considered non-permanent, which requires a burner recycle at least once every 24 hours. Control functions and timings are factory set via unique micro-controller firmware. Through seven SMART LEDs, the control provides current operating status and lockout information in the event of a safety shutdown. Refer to the BurnerPRO ordering information section in this document for the various combinations of control functions and timings. A complete BurnerPRO system includes the BP110/230, flame scanner and wiring base. The BurnerPRO performs a safe-start check on every burner cycle. If flame is detected prior to a start or during the purge cycle, the fuel valves are not energised and the control locks out. The ‘POC’ input is also monitored to verify that the main fuel valves are always in the proper state prior to the start of a burner cycle. The LEDs & alarm terminal are used to annunciate the presence of a lockout condition.